Up to 33% more light when compared with last generation models. LITE-BR-FLC Series utilizes Philips LUXEON 5050 LEDs and Mean Well HLG LED Drivers to reach up to 160 lm/W. Available in 10°, 30°, 90° and 120° beam angles and up to 160lm/W. The LITE-BR-FLC Flood lights are a specialized premium commercial grade high output Flood light used in industrial applications where day light is required including factories, loading docks, crane, building/bridge lighting, etc. Available in 300W, 400W and 500W modules, and 10°, 30°, 90° and 120° beam angles there is enough flexibility to suite most applications and roof or tower heights. The LITE-BR-FLC-500 120° with an operating power of 480W and 160lm/W using LUXEON 5050 LEDs exceeds the lighting output of all other 500W flood light models. With 76,515lm the LITE-BR-FLC-500W surpasses the lighting output of a 2000W conventional metal halide Flood light. The positioning of the LEDs allows almost 100% light projection towards your sporting oval, loading dock, car park or factory, unlike the sideways mounted and omni-directional bulb of a metal halide which has much greater light scatter losses and relies on the quality and efficiency of the reflector. The 120° flood lights consist of an array of the latest generation Philips LUXEON 5050 LEDs with primary applications being downlights, Flood, low bay, and stadium flood lights. Introduced in January 2018, the Philips LUXEON 5050 with an output of up to 175lm/W (4000K, CRI min 70) offers superior luminous flux at max current for reduced LED count. A CRI of minimum 90 at an output of 134 lm/W at 5000K is still possible. The Luxeon LEDs in the LITE-BR-FLC 300W to 500W highbay lights are driven by Mean Well HLG series LED Drivers. Backed by an independent 7 year 60,000 hour warranty and established in 1982, Mean Well is a leading standard switching power supply manufacturer in the world. 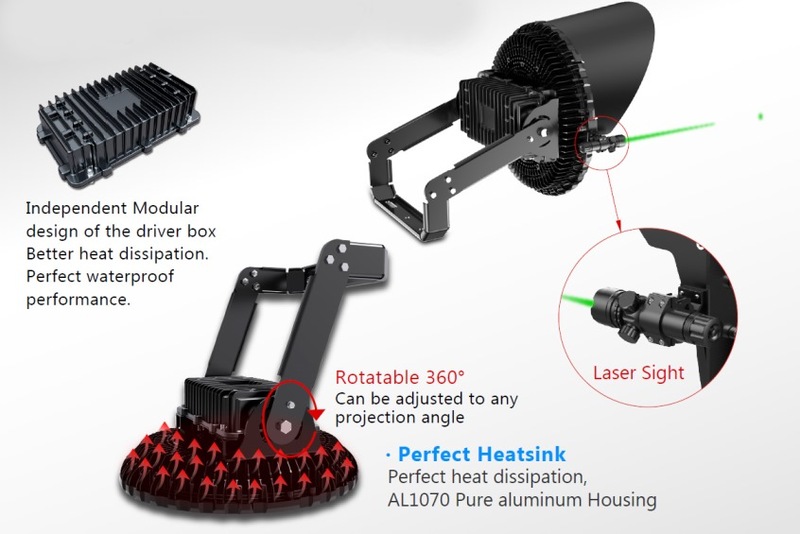 As shown in the image the Mean Well drivers are mounted independently from the LEDs with large air gaps and separate heat sinks to permit maximum cooling of both LEDs and power supply for increased life span. 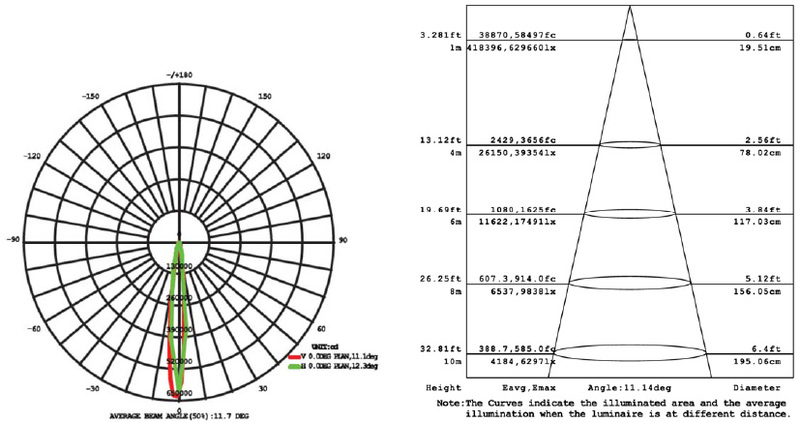 Note the Lumens represented in the Illuminance Cone Diagram is equal to 78% of the total light output. Allow for light scatter and reflectance in surrounding areas when making estimations. 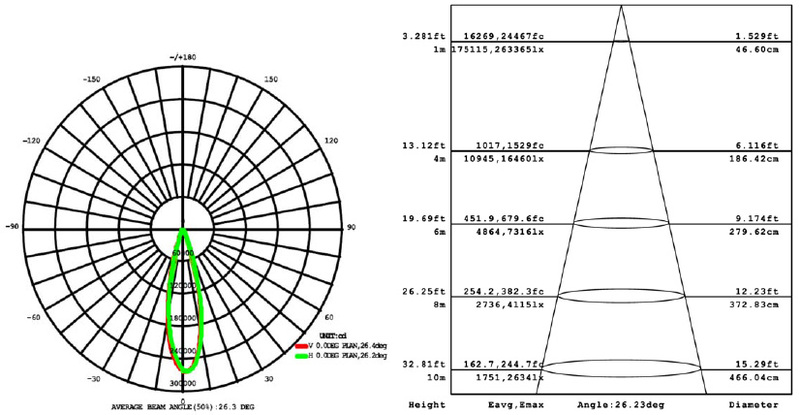 Note the Lumens represented in the Illuminance Cone Diagram is equal to 51% of the total light output. Allow for light scatter and reflectance in surrounding areas when making estimations. 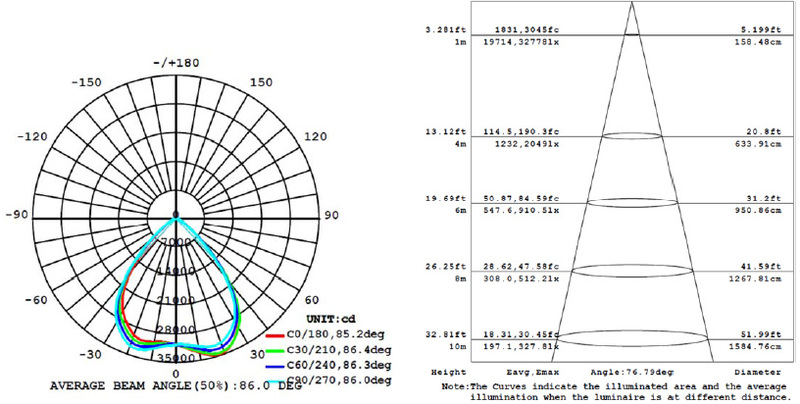 Note the Lumens represented in the Illuminance Cone Diagram is equal to 26% of the total light output. Allow for light scatter and reflectance in surrounding areas when making estimations. 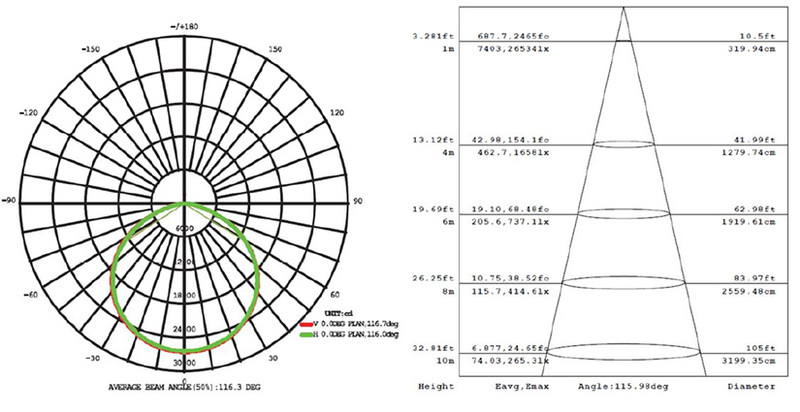 Note the Lumens represented in the Illuminance Cone Diagram is equal to 69% of the total light output. Click the button below to add the 160 lm/W Class Leading 500W High Output LED Flood Light - Highbay Exceeds 2000W Metal Halide Flood Light Replacement to your wish list.